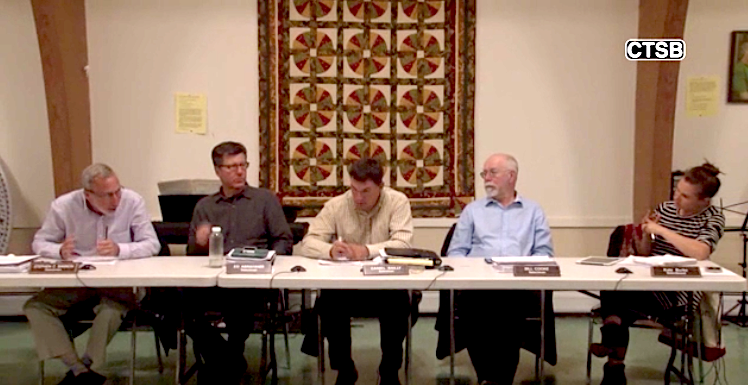 Great Barrington — If there were ever any doubt about it, it’s official: The town has now entered the public phase in deciding what to do about Housatonic Water Works, the private water company serving the portion of Great Barrington that bears its name. The company has been plagued by a series of actions taken by state officials and, over the last several months, a barrage of complaints from ratepayers about brown water caused by rusting water mains. The small company, which serves fewer than 900 customers in the Housatonic section of Great Barrington, has been the object of numerous complaints from ratepayers who have grown more and more agitated — both in Town Hall confrontations with officials and on social media. Others have complained of inadequate communication from the company about upcoming water main flushings that cause the discoloration. Some have called for the town to take the company over. 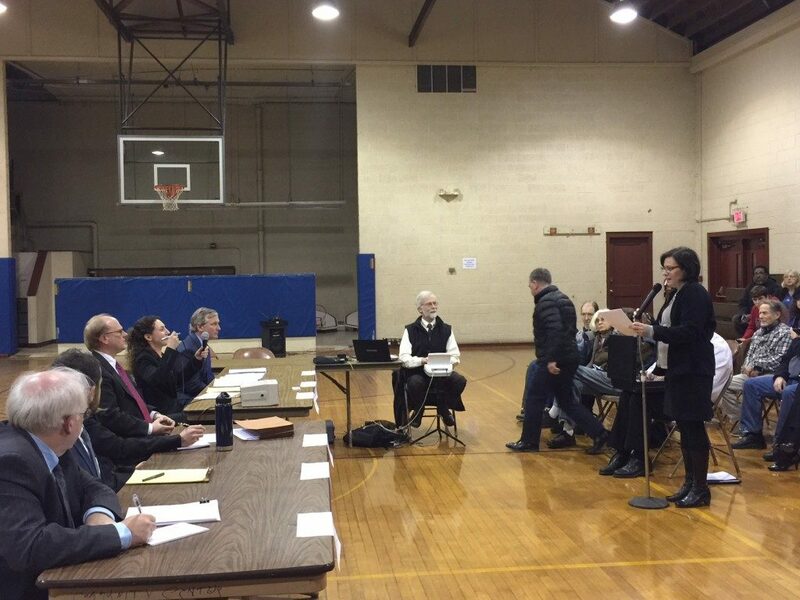 For its part, the town has emphasized that Housatonic Water Works is a private company, not a town department, and so the town’s ability to regulate it is severely limited. As a public utility, the company is, however, regulated by the state Department of Public Utilities and the state Department of Environmental Protection. At Monday’s selectboard meeting (October 15), after hearing from yet more Water Works customers, the board announced that, about a year ago, it had commissioned a report by David Prickett of DPC Engineering, a civil and environmental engineering consulting firm based in Longmeadow, to gather information on the water systems in the town, what the capital needs are and whether there are redundancies. 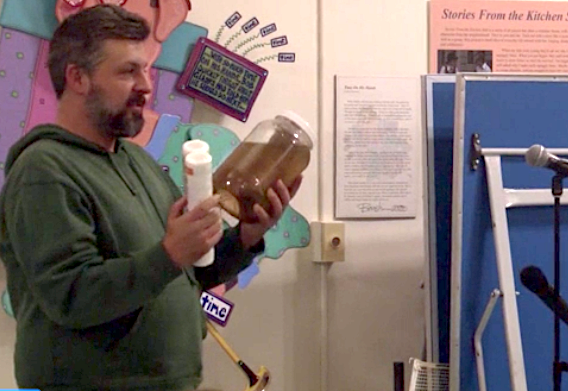 Nathan Turner, the chef at the Brick House Pub, brought a large jar of discolored water to the meeting and held it aloft for the selectmen and the audience to see. Turner noted the injustice of being told by the company to run his water in order to clear up the problem. Great Barrington has two water companies: the Great Barrington Fire District, which is a quasi-public organization with a publicly elected board, and Housatonic Water Works. The fire district serves downtown Great Barrington and many outlying areas. It has a much larger customer base. Prickett added that his report will be “the first of many steps in exploring this concept.” Any “combined utility, or alternative ownership structure” will require considerable work. “We note that this work can be time consuming and often takes several years from concept to implementation,” Prickett said. Several Water Works customers once again complained about discolored water. 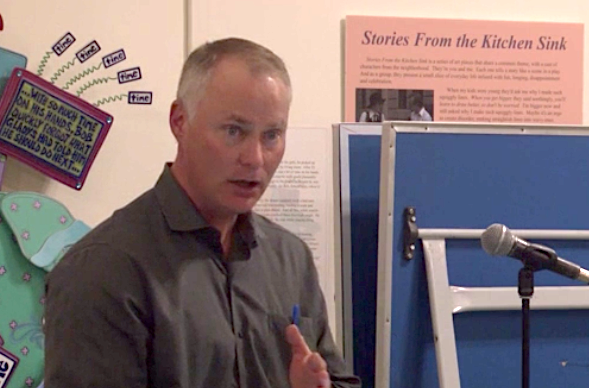 The meeting was recorded by Community Television of the Southern Berkshires. Click here and fast-forward to 16:00 to see the video of the portion of the meeting related to the Water Works. Click here to view a summary Tabakin wrote of information on the company, DEP and the town health department. And click here to read documents related to actions taken against the company by the DEP. For his part, Housatonic Water Works treasurer Jim Mercer has said the roily water is caused by rust in aging water mains. There is more rust now than in the past because the DEP has mandated higher chlorine levels, which aggravate the pipes. As for the infrastructure replacements, the company was granted a 30 percent rate increase two years ago, in part to fund upgrades because the system has had some issues with water quality monitoring over the years. HWW has worked to replace some of the company’s 16 miles of water mains, about 80 percent of which are over 100 years old. Some, Mercer said, are “original issues from 1888,” when the water company was founded to service the mills that had sprung up in the village. The company has said further rate increases would be necessary to fund more upgrades but the DPU would not approve of such a steep increase. The company draws its water from nearby Long Pond, which functions as a reservoir for the village. 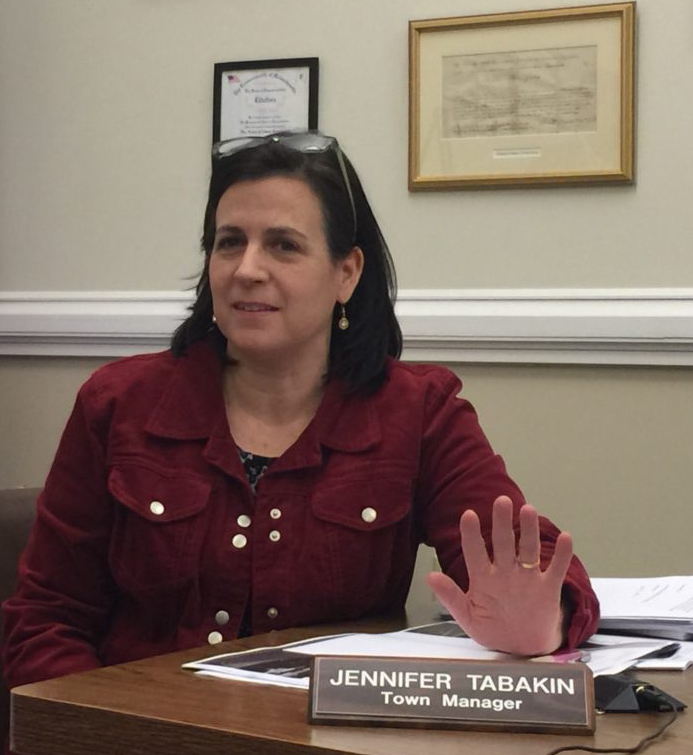 The selectboard agreed to hire Community Paradigm Associates to conduct a search to replace town manager Jennifer Tabakin, who announced over the summer that she would not seek to renew her contract when it expires next June. Bernie Lynch, who heads the search firm, presented a proposal for services to the selectboard. Click here to read it and click here and fast forward to 2:12:00 to see Lynch’s presentation to the board. Selectboard Chairman Steve Bannon said Lynch’s company comes highly recommended and he has already checked out several of its references. 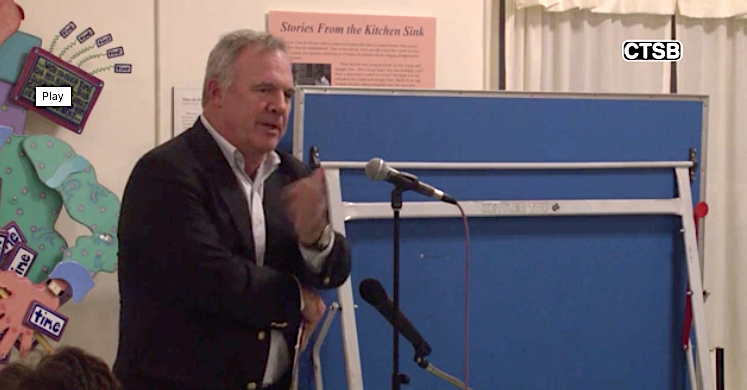 Lynch suggested the town form a screening committee to review resumes, interview five to seven candidates, and eventually forward to the selectmen three or four finalists for public interviews. Paradigm will assist the board with a variety of operations including advertising, the preparation of background material on candidates, the interviewing process, background checks and contract negotiation. The fee would be $13,000, with another $850 or so in expenses related to the search. Bannon has asked the finance committee to allocate $15,000 to use in the search. Finance committee Chairman Tom Blauvelt confirmed to The Edge that his panel okayed the funds Tuesday night. The last time the town used a consultant to hire a town manager was in September 2012, when the selectmen refused to renew the contract of the irascible Kevin O’Donnell because of poor performance reviews. The selectmen hired a search firm, the Collins Center for Public Management, to seek a new town manager in cooperation with a town search committee that included Berkshire Hills Regional School District Superintendent Peter Dillon and Michael Wise, who is now the town moderator and chairman of the Democratic Town Committee. The selectboard also approved a special permit for Manville Place, a mixed-use development planned for Manville Street off South Main Street (Route 7) near Ward’s Nursery. The special permit is required since the site sits in a water quality protection overlay zone above a subsurface aquifer. The proposal for three 15-unit apartment buildings with retail spaces at the end of Manville Street, a short, dead-end road with a handful of homes, had alarmed some residents of the quiet residential street. 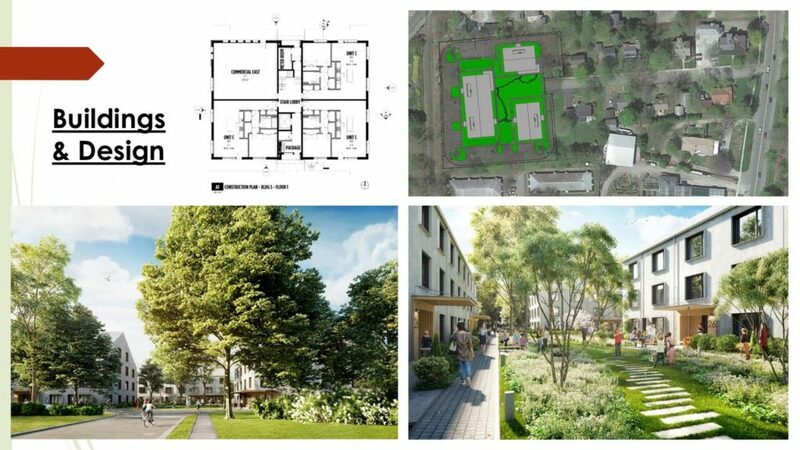 Click here to see an Edge article (with video) of a community meeting in July at which developers Ian Rasch and Sam Nickerson tried to address their concerns. And click here to see an article and video of the first site plan review hearing before the planning board last month. Hey John, what are you implying? I think the last thing the town wants is to “take over” the struggling, embattled Housatonic Water Works with its huge pile of deferred maintenance. Whose fault is it that 80% of the pipes in the system are over 100 years old? That would imply to me that regular maintenance and replacement have been mostly been put off except for bandaids in emergency situations. The company got a 30% rate hike just a year or so ago on water that was already much more expensive than the rest of GB. If the HWW had planned for regularly scheduled replacement all along, for 100 years, it would not be in this mess, nor would its customers. Seems like the fair thing to do is to spend some of the money taken in over the past 100 years on the maintenance that should have been done rather than seeking another outrageously high rate hike. ” In 1984, Barbara Pearson, widow of Dr. Pearson’s grandson, sold the company to the Frederick J. Mercer family of Housatonic. The above was clipped from HWW website . So when they bought it back in 1984 sections were ALREADY 100 years old ! So why in hell didn’t they simply charge the customers just a little bit more in the very beginning with an eye on funding this major overhaul in the future ? Why bother …..if you ask the state in a very nice way they will grant you an increase, and by the way. Just because you GET the increase, this doesn’t mean you actually have to spend it on anything … well maybe a newer Ford truck , like they did with this increase ! Why ….because they are a PRIVATE company servicing the Public , Life giving water ! The town doesn’t have any teeth to sink into them ! If it was a bar with a liquor license with a problem, it would be a totally different scenario ! Because you CAN’T live without booze ! We don’t have our priorities in order !